Champion Oil recently added Pacific Performance Engineering (PPE) as a Master Warehouse Distributor and Retailer for its product line of Blue Flame® Performance Diesel Oils. Pacific Performance Engineering is an industry leader in high performance diesel technologies for Chevy, Ford and Dodge. Founded in 1985 as a diesel performance facility in Fullerton, CA, they are known worldwide for finding new ways to improve upon factory platforms. There are many choices and possibilities today in the world of diesel performance. General Motors, Ford and Dodge continue to develop strong reliable diesel engines, and their improvements are noteworthy. However, it has always been at the top of PPE's agenda to supply additional power and torque beyond OEM, so teaming up with Champion and its innovative Blue Flame® Performance Diesel Oils is a logical move. Champion Brands Blue Flame® Motor Oils are formulated with workhorse high-zinc performance additives, advanced polymer technology, and high TBN, supported by a carrier blend of synthetic and conventional base fluids. In addition, Champion Brands Blue Flame® Diesel Motor Oil delivers unmatched high temperature film strength and lubricity protection, has the muscle to combat oil shear, maximizes and sustains cylinder compression, and is proven to increase engine horse power and torque. 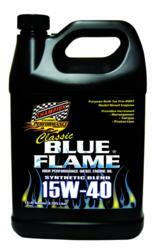 Champion Brands Blue Flame® Diesel Motor Oils are purpose built for extreme protection and performance. About Champion Brands, LLC: Globally recognized industry leader in specialty lubricants for over 55 years. Champion also produces and blends over 300 products including fuel, oil, engine additives, and lubricants for the automotive, racing, heavy truck, agricultural, industrial, and specialty markets. For more information about Champion Blue Flame® Diesel Motor Oil contact your nearest Champion distributor, or call Champion at 800-821-5693 or 660-885-8151. Champion Brands, LLC; 1001 Golden Drive, Clinton, MO, or go to http://ChampionsUseChampion.com.